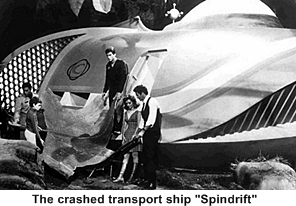 The year is 1983 (this is actually 15 years in the future from 1968 when the show aired) and the transport spaceship Spindrift runs into a space storm. Instead of completing its flight between Los Angeles and London it crash lands on an alien planet. The planet looks a lot like earth except everybody and everything is 12 times larger that they were on Earth. Captain Steve Martin (Gary Conway) with his First Officer Dan Erickson (Don Marshall) and flight attendant Betty Hamilton (Heather Young) must not only keep the passengers alive but also find them a way home. 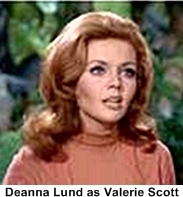 Of the passengers there is a women, Valerie Scott (Deanna Lund) who would become the Captains love interest. Also on the passenger manifest is an escaping bank robber Alexander Fitzhugh (Kurt Kasznar), a boy Barry Lockridge (Stefan Arngrim) and a know-it-all engineer Mark Wilson (Don Matheson). 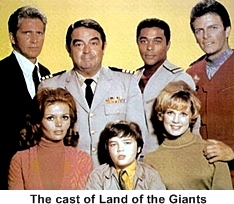 the character mix is very reminiscent of crew from Lost in Space. 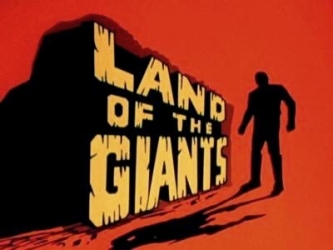 There is plenty of drama in this sci-fi program with the giants wanting to capture our stranded heroes to gain their advanced technology and to find their own way to Earth which must be rich in resources. The crew also becomes embroiled in the internal politics of their new world with their lack of capture being a thorn in the Government’s side. This leads to some limited cooperation from certain dissident giants. Part of the group does from time to time get caught necessitating dangerous rescues by the rest of the group. 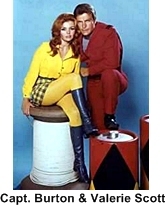 This was an Irwin Allen production from start to finish. 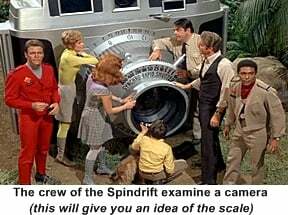 It had all of the same ingredients that you also found in Voyage to the Bottom of the Sea, The Time Tunnel and Lost in Space. 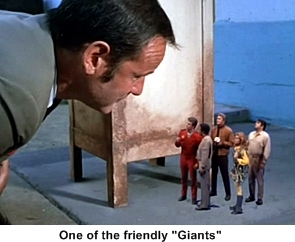 Many of the sets from those shows were used in the making of “Giants” especially anything with blinking or flashing lights.